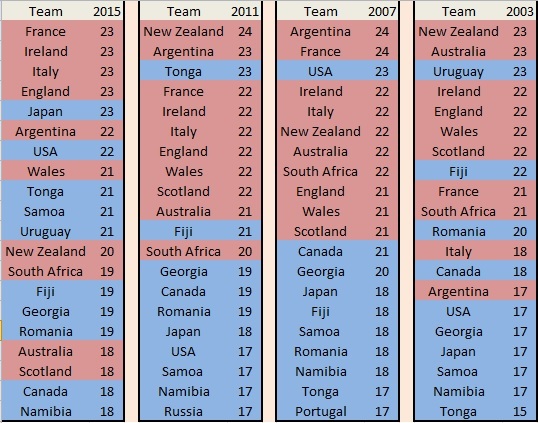 Rugby statistics: How fair is the RWC 2015 draw? Rugby Statistics: How fair is the 2015 Rugby World Cup Schedule? Fighting the same battle: Are teams from outside the traditional tier one looked after? In 2013 World Rugby chief executive Brett Gosper declared that the 2015 tournament would have “the most balanced and equitable match schedule in the history of the Rugby World Cup”. Looking at the 2011 pool stage fixtures below, it can be seen why change was required. Scotland were the only tier one nation that had to manage a three day gap between matches while the nine other breaks of that length were given to the tier two sides. New Zealand, France, England, Argentina, Ireland, Australia, Wales and Fiji all avoided three and four day turnarounds completely while at the other end of the scale – USA, Russia, Samoa and Namibia had to play their four matches in 17 day windows. Facing Wales and South Africa with less time to prepare that their opponents clearly put Samoa at a huge disadvantage and the issue of fixture disparity received media attention after a series of tweets on the subject from Eliota Fuimaono-Sapolu. The calls for a level playing field and to shake up the traditional format are understandable. 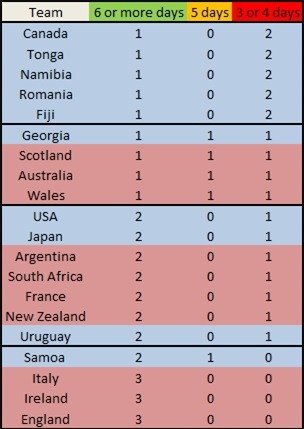 Looking back through the relevant rugby statistics, the most (or perhaps only) balanced and equitable match schedule in World Cup history actually occurred back in 1995, when 14 of the 16 teams each played their three pool matches in a nine day window. South Africa and Australia had ten days, but that was due to contesting the opening match. The Six Nations and Rugby Championship teams have played 132 World Cup pool matches against tier two opposition, winning 123 of them by an average score of 48-13. Looking at the 56 previous quarter-finalists from 1987-2011, 51 of them were tier one teams. The exceptions were Fiji in 1987 and 2007, Samoa in 1991 and 1995 and Canada in 1991. The tier two teams go into a World Cup already hindered by a difference in resources, availability of players and not having regular matches against the ‘big’ teams in the preceding four years. There doesn’t need to be a further handicap imposed of a tougher set of fixtures. So how equitable is the 2015 schedule? Namibia haven’t been done any favours again, but there are now five tier two teams with a pool stage window of 21 days or more compared to two in each of the previous three tournaments. The total number of days doesn’t give the whole picture though. In 2003 Uruguay had a 23 day fixture range but that was a split of three, four and 12 days between games. In 2007, USA’s total of 23 was broken down to three, three and 13 days between matches. There is a fairer division of the three day breaks this time, with five going to the tier one teams and five to those in tier two. That hardship has been mitigated for the tier one teams though, as New Zealand face Namibia afterwards, Australia meet Uruguay, South Africa play USA etc. In contrast, Namibia have a game against Argentina, Romania meet Ireland. It can also be seen below that Canada, Tonga, Namibia, Romania and Fiji all have to cope with two breaks of three or four days. Of the 11 sides that have the benefit of at least two longer rest periods of six or more days, seven of them are tier one nations. Tonga will have a nine day gap after playing Georgia in their opening match this year but then face Namibia, Argentina and New Zealand in 11 days. Romania may have decent preparation for their game against Canada but that is negated by the turnaround before their Ireland and Italy matches. Both those teams would stand a better chance of qualifying for the quarter-finals if they had favourable breaks between every round like England, Ireland or Italy. After successfully preventing Wales from facing Australia in Cardiff during the pool stage, former chief exec of the Australian Rugby Union John O’Neill said: “the only team with home-ground advantage is the hosts. After that, every other team has to be on a level playing field in terms of facilities, training and rest etc.” Why then have Fiji and Uruguay ended up with pool matches against Wales at the Millennium Stadium? It might be an improvement on 2011, but there is still work to be done before the World Rugby view that the tier two teams won’t “won’t have that excuse this time” of an unfair schedule is true.